Our school’s story starts with the sister institution Kissyfur International Pre/Kindergarten & Day Care Center. 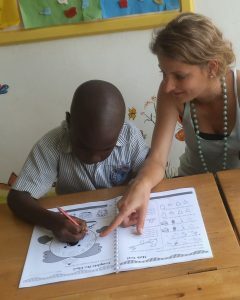 Since 1983, Kissyfur International has been at the forefront of academic distinction in Uganda. Due to the great success of the school, a primary section was opened in Entebbe in 2014. Pearl of Africa International and Kissyfur International are built on the same core values of hard work, dedication, innovation, as well as respecting and recognizing children as unique individuals with specific needs. Since we have started, our numbers of students, classes and teachers has grown steadily. The academic needs of students are catered for by small, child-friendly classrooms, a library and computer room, a Science laboratory, sports field and swimming pool. 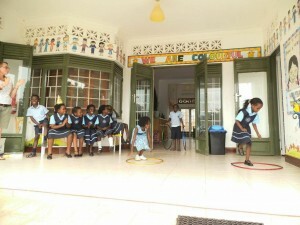 Pearl of Africa International Primary School is a co-educational day school located in scenic Entebbe, Uganda. Our institution is dedicated to developing children holistically: we believe that in education, the social, emotional, and physical achievements of our pupils are as critical as their academic achievements. Therefore, we pride ourselves on the development of each pupil’s unique qualities. Our lessons are structured to appeal to a child’s inquisitive nature and include hands-on learning experiences that provide children with the opportunity to be responsible for their learning and to reflect on it as well. This strategy is reinforced by small class sizes (18 pupils maximum) and a teacher pupil ratio of 1:8. This unique environment will enable pupils to develop the necessary life skills to thrive in our ever-changing world. Pearl of Africa International Primary School is set on an area of outstanding natural beauty in Entebbe, Nakasamba. 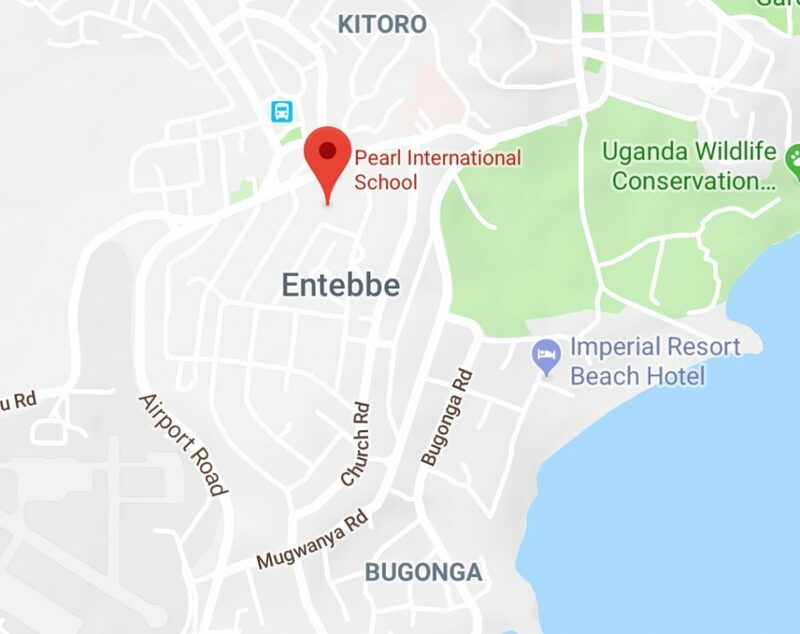 Our new compound is tucked in a quiet, residential area, but easily accessible (just a minute’s drive) from the main Kampala-Entebbe road (Queens Road before the airport stage). Would you like to visit us? You can find us on Nakasamba Close, Plot 10. The lake breeze provides everlasting fresh air for children to learn well and grow up healthy. One of our goals as a holistic learning environment is to connect students to community initiatives and various social projects. Children are given opportunities to become leaders and active participants in their community through our in-school activities and after school clubs. Through such initiatives, we are expanding the scope of our pupils’ education and preparing them to be responsible citizens and future leaders. Read more about our community projects in our blog. Our school admits pupils from a wide range of backgrounds, and no entry examination is required. We are currently open for all years in primary school. School registration and fees are affordable and competitive with other national and international schools in Uganda. We provide many extra curricular activities with no hidden costs, and school is open from 07:30 hrs to 17:00 hrs. Afternoons are spent doing homework with children, but we also encourage play in a relaxed and fun environment. We are proud to have opened our doors on February 3rd, 2014, under the direction of Milena Latincic, the Director of Kissyfur International Pre-Kindergarten and Day Care Centre. Our primary school continues to foster the same values that you have come to know and love at Kissyfur International: a happy and caring atmosphere, small teaching groups, and homely facilities that encourage all pupils to reach their maximum potential. Similarly, we continue to maintain a carefully selected, dedicated, and highly qualified international staff to provide the best education for your children. For a school visit or more information regarding Pearl and its programs, please email us at pearlschoolafrica@yahoo.com or call +256 414-320654 / (0)778-878388. Or visit our contact page.